Candyland is a game that probably everyone has heard of. Now 60 years old, it is probably the first board game that children start playing. A child really only need to know their colors and a few shapes to play; this is both a good and a bad thing. It is good that parents and kids play Candyland together because it is a way to spend time interacting and having fun together. But Candyland is not a great game to get kids started on because it really needs no thought, creativity or strategy whatsoever. If you think about it, once you pick a game piece and shuffle the deck, the entire game is already determined. No matter how “good” you are at Candyland it doesn’t matter – you will will the same amount of games (over time). There are no “Candyland Tournaments” or “Candyland World Championships.” There are no books or web sites you can visit to discuss Candyland “strategy” with other players. You can never been any “better” at playing Candyland, and you can certainly never get any worse. Candyland is a colorful and fun “game” you can play with pre-school kids and have a great time, but it quickly loses its appeal once you realize that it is basically a “coin flip” and that even “rock-paper-scissors” has far more strategic value. Still don’t believe me. Imagine playing “solitaire Candyland” with two teddy bears and realize you now have a 66% chance of losing to a stuffed animal. Jump ahead a bunch of years and we got the “wildly popular and exciting LCR” game that “everyone is playing" – and yes I was one of the suckers that dropped ~$5 on this “game in a tube.” If you haven’t played this game, it is pretty simple. You have 3 dice and a bunch of mini poker chips which are divided up among all the players. You roll the dice and will get either an “L” a “C” an “R” or a “*” (dot). If you get a dot (there are three per dice) then you do nothing. An “L” means pass a chip to the person on your left, an “R” means pass a chip to the person on your right, and a “C” means pass a chip to the center “pot” which grows as the game progresses. Once everyone is out of chips except one person, then the game is over. As you probably have figured out already, this is basically Candyland with dice. Sit down with the same two teddy bears as above and you will lose far more than you win. This isn’t to say you can’t have fun playing LCR – I’ve had a lot of fun playing Candyland and LCR – but the fun is more about the people you are spending the time with than the “game” itself. Some of the recommendations I have read for making LCR more fun often include substituting money or M&Ms for the chips or adding a drinking component. By the way, if you don’t tell anyone else you can play “LCR” right now at home with three 6-sided dice and some pretzels: 1=L, 2=C, 3=R, 4-6 do nothing – saving you $5 and some frustration. There was a posting on Board Game Geek called the “Comprehensive LCR Strategy Guide” which is a very creative and funny read. Some “strategies” for playing LCR include “Throwing Off Your Opponents” and even “Cheating”. And beyond the humor this got me to thinking. When people get into what they consider to be a “no win” situation or even one where their “fate has already been determined” many are not content to just sit by and watch. If the rules aren’t fair – change the rules (bonus points if your just thought Kobayashi Maru). If you can’t change the rules – make your own rules (i.e. cheat). What if you could take a game like Candyland and LCR and find a way to give a particular player a better chance of winning than other players – say in a game with four players, what if the players had these chances to win: 20% 20% 20% 40% (i.e. the last person is twice as likely to win as any of the other players). This, clearly, wouldn’t be fair and most people would call this cheating. What if it wasn’t cheating, but right in the rules and what if all you had to do to get a better chance of winning was to pay some extra money. If you pay $20 extra dollars then you get to play with a different deck when you play Candyland – a deck that has better cards, no traps, and more doubles. What if LCR had a more expensive “expert” version that let certain players use dice that had better odds than other people – again not fair. But this is exactly how most games on Facebook work. Enter Warstorm. I’ve spent several hours over the last week playing Warstorm on Facebook, or more accurately watching Warstorm play itself in front of me. A couple family and friends started playing it and were talking about it, and you know I like a good game. On the surface Warstorm is very compelling and well designed. The application itself is visually stunning, the art is professional, the application programming and design is cutting-edge, and there are a great number of people playing it. But, if you really break it down, it is really a beautifully drawn, interactive, action-packed, implementation of “Candyland” but with “cheating” built in if you want to pay for it. Without going too deep into the game itself, suffice it to say that all players of Warstrom start with the same limited collection of cards that they build up squads or armies of infantry, cavalry, archers, and many others to fight against one another. Each card takes a certain number of turns to come into the battle (bigger/more powerful cards take longer) and have different strengths and weaknesses. This initially sounds like Pokemon or Magic The Gathering – but it really isn’t, for a couple of really important reasons. In Pokemon and MTG the players actually get to play the game – in Warstrom you take your squad(s) and the computer plays the game in front of you. In fact, when you press “Ready” it could just tell you who won without all of the fancy battle graphics and animations; the computer already knows who won. 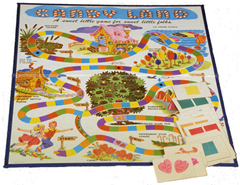 As soon as the cards are “shuffled” the outcome of the game is set – just like Candyland. However, unlike Candyland you can improve your odds of winning if you have some money to spend (or a whole lot of time on your hands). Here is a quick example – two different versions of two different cards. The important thing to notice in this example is that these cards are identical except for the little number in the bottom left-hand corner – this is the number of turns it takes for these cards to come into play. So the first “Barbarian Warrior” will come in after 8 turns, but his otherwise-identical counterpart will come in 2 turns earlier. In Warstrom timing is everything. If two people built decks where one used the “8” cards and one used the “6” cards they would have a 25% better chance of winning each battle. The second two cards are even more extreme as the one card has a 50% speed advantage over the other one. And how do you get the “better” version of the cards, pay real cash money for them, or play a lot (seriously a lot). One more example to show how far this can go – in the bottom right of these cards there is the attack power and toughness (how much damage they can take). The power/attack is what is important to beat the opponents army. You want powerful cards out quickly. The first card in this example is a 3/1 that comes out in 1 turn – so on the second turn this one is already attacking for 3 damage. This is an “Expert” card which means each pack of cards “costs” you 12500 silver (3-4 days of playing) or 5 gold ($1 cash = 4 gold). And this only gives you one chance of getting this card – there are many hundreds of different cards. The best an “average” can do to get a 3 power card is to hope for an “Aanden Silverback”. They are more common, but take 8 turns to come out – so the Golem that came out on turn 2 can kill the Silverback that comes out on turn 9 (or turn 7 if you pay more money). If this isn’t bad enough, the Golem is “Animated” which means that even if your turn 9 Silverback kills the Golem he has a 50% chance of coming back into play one turn later. Crazy. Any game where the person who spends the most money wins just isn’t fair, and any game that just “plays itself” gets frustrating or boring very quickly. So, while it took me a good week to realize that Warstrom was unfair and frustrating, at least I did and I am out. Sorry guys. But I won’t leave this on a down note. Instead of Candyland, LCR, and Warstrom let me recommend three real games that fit the same need but are fun, use your creativity, and have a good combination of luck and strategy. With kids, instead of Candyland, try Checkers – with friends, play a simple card game like Rummy instead of LCR – and if you like the collectible card construction type of game, you can’t go wrong with Dominion. Remember, after playing a good game will have you thinking about what you could have done differently, and what you want to try the next time you play, these three will do that. Amazing, really outstanding information. Your blog is really awesome. I bookmarked this and may return once again. Good post, good work. It Couldn’t be wrote any greater. Reading this post reminds me of my old girlfriend! He constantly kept blabbing about this. I will forward this article to him. Pretty sure he will have a gratifying read. Thanks for sharing! I was very delighted to locate this site.I wanted to thank you for this great read!! I certainly enjoyed every little bit of it and I have you bookmarked to check out new stuff you publish. Hi, I found your blog through Google search and read some of the posts here. I’ve to say that your blog post are very unique that i’m unable to find elsewhere. Your blog have benefited me in many ways and I want to say Thank You! I’ve bookmarked your site and will be coming back often. It becomes obvious that there is far more to know about it as I expected. I think you made a lot of good points in your post. Nice share. Posts like this will definitely keep me coming back to your blog. Definitely going to check out more from this author. Very useful publish. I have been hunting for this piece of writing for ages in lots of sites. I composed a couple posts just concerning the corresponding study but you appear to experience a bit more about it than I do. Wii users will be able to purchase a selection of new items for their own Avatars with cheat code. Intimately, the article is actually the best on this precious topic. I harmonise with your conclusions and will thirstily look forward to your coming updates. Saying thanks will not just be adequate, for the fantasti c clarity in your writing. I will immediately grab your rss feed to stay abreast of any updates. De lightful work and much success in your business efforts! I know some people with problems opening the site using Opera. I tried again using Firefox and it seems to be alright.I think I get the same errors in Opera also.Hope that was helpful.